Diabetes is close to my heart and unfortunately, my own home. Most of my family is diabetic and I received my own diabetes diagnosis around a year ago. While it can be treated conventionally, that wasn’t a route I wanted to go unless I absolutely had to. I don’t like chemicals and I don’t like conventional medications if I can avoid it. My body doesn’t react to them the way that most people do so taking a conventional treatment can actually do me more harm than good. When I first found out I was diabetic, I made a deal with my husband. I could try natural treatments for diabetes first and only if they failed would I go on more conventional diabetes treatments like medicine or insulin. I can be rather crunchy at times and I’m well aware of the benefits of essential oils so the first thing that I did was look up the different essential oils for diabetes to help harness nature in helping my body to heal. My father was just 54 years old when he died from complications related to a diabetic ulcer. If you aren’t sure what that is, it is basically an open wound that won’t heal. The ulcer got gangrene and as a result, his entire body turned septic. As a result, he passed from a heart attack ten years ago. I’d love to tell you that he did everything that he could to manage his diabetes, but the truth is that he didn’t. I have vivid memories of watching him eat sweets and other sugar filled foods day in and day out. When I received my diagnosis, I realized that in this area, I didn’t want to be like my Dad. I wanted to live past my fifties. I want to be around to watch my child and grandchildren grow. I wasn’t only dealing with diabetes though. I was also dealing with chronic pain and a small truckload of health issues. It was that realization though that led me to looking for natural pain relief and natural diabetes treatments. If you’ve got diabetes, these oils won’t cure it. There is no known cure for diabetes. What they can do is help manage your blood sugars and other symptoms that come along with being diabetic. Some will be able to help regulate blood sugar while others will deal with more specific symptoms such as diabetic neuropathy (pain). You’ll need to do some research to find the oil or oils that will work best for you specifically. Since you’re looking for natural diabetes treatments, you may also want to take a look at a few home remedies for high blood pressure too. A lot of them go hand and hand together. When using essential oils for diabetes, make sure that you’re only using 100% pure essential oil and just ignore any “therapeutic grade” wording. There are no federal standards in the US for essential oils which means that anyone and everyone can slap the words therapeutic grade on a bottle of essential oil no matter what is in it or what the oil is cut with. For my own natural diabetes treatments, I use Plant Therapy essential oils. They’re budget friendly and the selection that they have is wide enough that I can treat almost anything we have going on or make my own homemade cleaner recipes without having to search forever for one specific oil. They’re also 100% pure oils which means that they aren’t cut with any kind of carrier oil before they get to me. You can use these essential oils for diabetes in a couple of different ways. First, you can pick up an essential oil diffuser and diffuse them through the air in your home. This has the added benefit of helping your home to smell amazing and letting others in your home get the benefit of the oils too. If that doesn’t work for you, you can mix them with a carrier oil such as sweet almond oil in an essential oil roller bottle to directly on your skin as a massage oil. Coconut oil also makes a fantastic carrier oil and actually has fantastic benefits for diabetics too. As always, we are not doctors here at Six Dollar Family. Make sure you speak with your regular doctor before starting any kind of treatment; natural or not. This is especially important if you’re on conventional medication since some oils can affect how your medicines are absorbed or may interact with them in a way that isn’t good. Cinnamon is well known to have quite a few health benefits, but it can be especially helpful when used as an essential oil to help diabetes. There is significant research available to show that cinnamon can help reduce blood sugars, lower cholesterol and more. Cinnamon essential oil is best used in cooking, but it can be mixed with a carrier oil and applied to the skin or inhaled from a diffuser as well. Since cinnamon is a very hot oil (meaning it can burn your skin), don’t apply it directly to your skin without a carrier oil. Clove is a spice that comes from the flower bud of an evergreen tree that originated in Asia and has been used for its medicinal purposes for hundreds, if not thousands of years. It has quite a few benefits including fighting acne, toothaches and more, but it can also help to stabilize blood sugars. If you’re taking an anticoagulant, using Clove essential oil topically may not be a good idea since it can cause bad irritation. Clove is best taken internally so you can either cook or bake with it or you can add it to a vegetable capsule and take it as a supplement. If you do decide to use it as a massage oil or in a roller ball, make absolutely certain to dilute it. Coriander essential oil is derived from the seed of a plant that is similar to parsley and originates in Western Asia or the Eastern Mediterranean regions. It is one of the oldest spices known to man and is widely used for medicinal reasons. 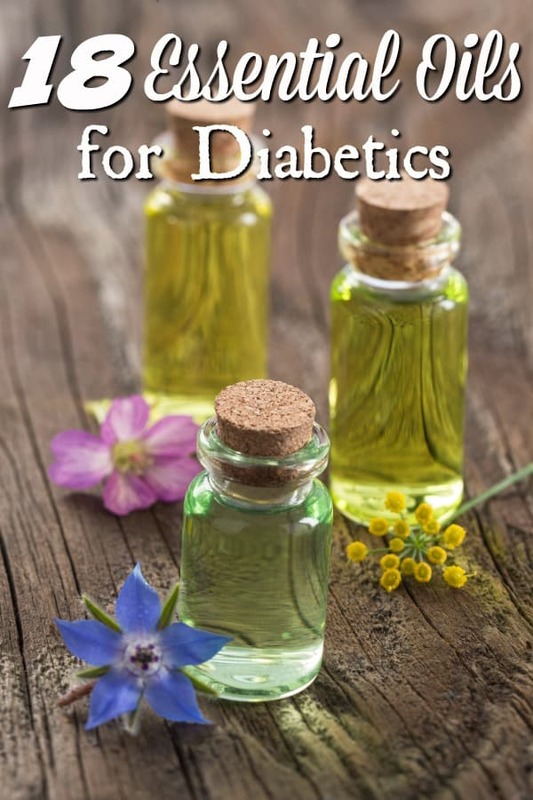 It has a lot of benefits including treating digestive problems and helping with colic in little ones, but as one of the essential oils for diabetes, it works to help your pancreas secrete insulin the way that it should. There is also some evidence that it exhibits insulin like activity at the cellular level which helps to control your diabetes even more. For best using coriander, mix it with a carrier oil and any other essential oils you want to use in a roller ball to create an essential oil blend. As evidenced by the Bible story of Christ’s birth, Myrrh has been used for thousands of years. In modern times, it is used to support the immune system and has great antioxidant properties. Those antioxidant properties make it one of the best essential oils for diabetes that you’ll find. Aside from that it can also help to control blood sugar levels. Myrrh essential oil can be used in a diffuser, as a topical blend or in cooking if it is food grade. Ocotea essential oil is made from the Ecuadorian tree, has many different health benefits and is similar to cinnamon. When consumed as a tea it has been shown to greatly help balance blood sugars. It can be inhaled through a diffuser or applied topically as well though. It is considered a hot oil so don’t apply it to your skin without using a carrier oil. Lemon oil is fantastic in homemade cleaner recipes like my homemade all-purpose cleaner, for ringing ears and the common cold, but it’s also great for diabetics. Diabetes often comes with high stress and tension which can lead to other health issues like high blood pressure or heart problems. Because lemon essential oil is considered detoxifying, antiseptic, and a disinfectant, it makes it fantastic for cleaning and for use as a home remedy not only for diabetes, but also a home remedy for the flu. High blood sugars can also cause depression. Lemon oil can help reduce that stress and treat any depression that comes with out of control blood sugars. Lemon essential oil is best when taken in a veggie capsule or added to water since applying it to your skin can increase your risk of sunburn. Vetiver essential oil is a soothing oil which makes it great for diabetics to use as a muscle relaxant. Mix it with a carrier oil and massage into sore and painful muscles. This is great for diabetics who suffer from foot pain or other forms of neuropathy. To use for a calming effect, diffuse Vetiver oil into the air. Vetiver oil should not be used at all by pregnant women. Just a heads up before we go into the benefits of Clary Sage essential oil. It should not be used by pregnant women. I can cause softening of the uterus which in turn could cause miscarriage. For diabetics, clary sage oil can be used to help prevent renal disorders. In short, you can use it to help take care of your kidneys which is a huge must-do for diabetics. Yes, the same thyme that you cook with is a fantastic natural diabetes treatment. Thyme essential oil can be helpful in preventing things like psoriasis, heart disease or bronchitis which a diabetic is prone to. Thyme essential oil isn’t recommended for kids, pregnant women or people with high blood pressure. It can be taken internally in a veggie capsule, used for cooking, or mixed with a carrier oil and applied topically. If you’re going to cook with it, make sure you don’t use as much as you normally would with the dry spice. Essential oils are extremely potent so it will quickly overpower your food if you use too much. Ylang Ylang essential oil can be both calming and stimulating to your mind so it is very useful for diabetics who might be dealing with stress or anger due to high blood sugars. It can also help with circulation when it is diffused which makes it great for anyone who is having circulation issues or high blood pressure issues. You can also apply it topically with a carrier oil. The backs of the wrist or neck is usually best. Speaking of circulation issues, Cypress essential oil is another great one for fighting them. It is probably the best essential oil for circulation issues that you could find and it will also help with any cardiovascular issues. Diffuse it or mix with a carrier oil to apply topically. Fenugreek is fantastic for diabetics whether in fenugreek oil form or in the form of a fenugreek supplement. I actually take fenugreek myself twice a day. It helps to increase insulin sensitivity in the body meaning it can help to regulate your blood sugar. It can also help to keep your energy levels high which is important for a diabetic who is too sleep because their sugar is too high. Black Pepper Essential Oil is great for a lot of things including help to stop smoking but it is especially helpful when used as part of an essential oils for diabetes treatment plan. It can actually help to treat the disease and some studies have shown that it may even prevent it. It helps to naturally restrain two of the enzymes that are responsible for breaking starches down into glucose which helps to regulate your blood sugar as well as slows down how quickly your body absorbs sugar. Eucalyptus is great for more than helping to open up your airways when you have a cold. It can also do things like cure receding gums, break a fever, stop an asthma attack and increase circulation. There is also some research that Eucalyptus essential oil can also actually lower blood sugar. One thing to watch with it though is lowering your blood sugar too much if you’re already taking medications to lower it. Frankincense is one of my favorite natural diabetes treatments and essential oils for diabetes for a couple of reasons. It is fantastic for pain relief, helps to build your immune system, can improve digestion, help reduce stress and can even help your body absorb nutrients that it needs easier. For a diabetic, all of these are incredibly important. Frankincense essential oil can be diffused or applied topically with a carrier oil. I like to make a blend of lavender oil and frankincense and use it daily to help keep my body working the way that it should. One of the things that a diabetic is especially prone to is slow healing wounds. If you remember from the beginning of this post, that is actually what slowly killed my father. Tea tree essential oil is antibacterial, antimicrobial, antiseptic, and antiviral which makes it the perfect natural diabetes treatment for those slow healing wounds and a whole slew of other benefits. You can apply it around any wounds that you have or do like I usually do. Apply a bit of a tea tree oil, four thieves oil and lavender lend to your bandage and cover your wound like normal. Tea tree is considered a hot oil so before you apply it topically be absolutely certain that you mix it with a carrier oil. If you have a first aid kit with essential oils, tea tree is one of the ones that you definitely want to have included. Another citrus oil, grapefruit essential oil is great for diabetics who may need to lose weight to control their diabetes. Research has shown that it can function as an appetite suppressive which can help you to eat less. It can also benefit the kidneys since it helps to flush toxins, calcium and other uric deposits from them. For a diabetic, this kidney protection is invaluable. Finally, it can function as an antidepressant. For someone who is dealing with high blood sugar, depression can be one of the very first symptoms that occurs. Finally, lavender essential oil is a great natural diabetes treatment. In fact, if I could only pick one essential oil to treat diabetes with, it would be lavender. 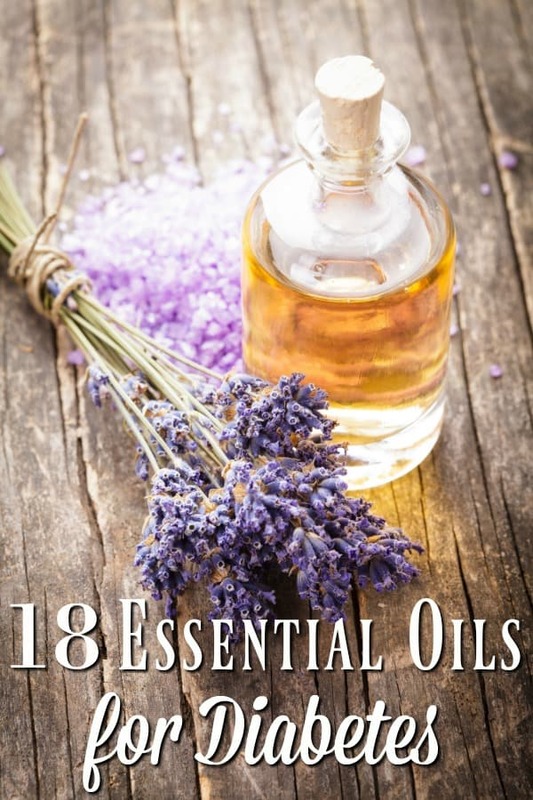 In my opinion, lavender is a super oil since it has so many different benefits. It can help with pain relief, aid in digestion, assist circulation, help your kidneys to function better, treat depression, migraines, boost your immune system, help you sleep better and more. It is a mild oil and can be applied topically without too much worry about irritation. (Although it is always best to err on the side of caution with essential oils). Diffusing it into the air can also have huge benefits too. While most of these essential oils for diabetes won’t cure your blood sugar issues, they can help treat the symptoms and make your life a little easier. Talk to your doctor and give them a try. You really have nothing to lose, but you will gain better health. Ginger, I don’t recommend internal oil usage. A carrier oil is an oil like fractionated coconut oil or sweet almond oil that you mix with the essential oil to dilute it. Some oils are “hot” and can burn or irritate your skin when applied directly. As for use, add several drops (start with 5 and go up from there depending on the size of your container) and top off with the carrier oil to a rollerball. Apply to your feet, wrists, etc. Debra, you should be able to click the red links in the post and it will take you to the oil I mentioned. Is It safe for diabetic pregnant women to use Lavender essential oil? Richard, check with her OB or midwife. Some EO’s are safe during pregnancy while others aren’t. One thing she could try is tart cherry juice. Cherries have a lot of benefits while pregnant including potentially lowering blood sugar. I love everything about your blog. Your explanation of how to use the oils is so helpful. As I was reading though I did not see how to use Clary Sage. Do you have any input on this one? As a diabetic taking cholesterol lowering meds, eating/drinking grapefruit/grapefruit juice is not recommended. Do you have any information on the interactions of grapefuit EO and cholesterol meds? Grapefruit EO would react the same way as eating or drinking it so it is probably best to stay away from it if you’re on meds that will interact with them. In fact, I’d be wary of any citrus oil since they could have the same interaction. Talk to your doctor though to be sure and definitely before you start using any oils since you’re on other meds. Barbara, In mentioning how to use Clary Sage, I add several drops of Clary Sage to Epsom salts and stir in just a tablespoon of either shampoo or castile soap and then mix it in with my bath water. The body will absorb the essential oil as it does the magnesium from the Epsom salts.